In a fast-paced, competitive environment, decisions must be made accurately and quickly; there is little time for prolonged discussions, and even less time to correct the outcome of a poor decision. Essential to the process of making fast, accurate decisions is the need to confront differences of opinion in a positive but hard-nosed manner. Unfortunately, many people do not have the skills to do this effectively. Either they don’t speak up and make their opinions known, or they push their point of view so hard that they offend the other person and the discussion escalates into a battle of wills or a clash of personalities. Developed by renowned trainer and speaker, Larry Johnson, Constructive Confrontation is a no-nonsense training program that gives people the skills to confront issues directly, and to resolve differences positively. According to Andy Grove, Intel CEO, the ability to be constructively confrontive when dealing with any on-the-job problem has been a key factor in Intel’s incredible success. 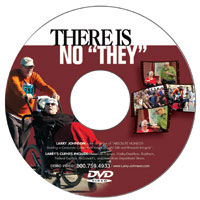 Larry Johnson now offers Constructive Confrontation in this exciting DVD program recorded before a live audience in Tempe, Arizona.